The macaron is typically filled with ganache or buttercream that is sandwiched between 2 cookies. 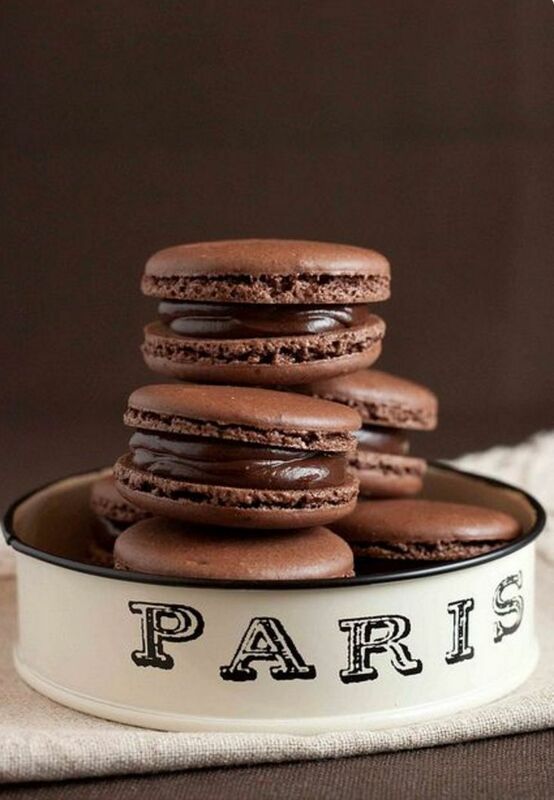 I had my fair share of macarons in Paris as it seemed to be the cookie of France (although it originated in Italy). Today, it remains the best-selling cookie in pastry retail stores. I would suggest that you visit Pepone Cafe, or Laduree to try one for yourself. Posted below for your enjoyment is a chocolat macaron recipe! Preheat oven to 350 degrees. Line a baking sheet with parchment paper, and set aside. Break chocolate into small pieces, and then transfer to a medium heatproof bowl. Set bowl with chocolate over a pan of simmering water; stir until chocolate is melted. Let cool slightly. Pour melted chocolate into a large bowl; add cocoa, sugar, coconut, egg whites, vanilla, and salt. Mix with your hands until well combined. Dampen clean hands with cold water. Mound 1 1/2 tablespoons mixture into a loose haystack shape, and transfer to lined baking sheet. Repeat with remaining mixture, arranging macaroons 1 inch apart.